To see or not to see? With this version of “Hamlet,” there is no question. WASHINGTON — To see or not to see? This time, there is no question. The Washington Ballet brings William Shakespeare’s “Hamlet” to the Kennedy Center for a two-week stretch from March 23 to April 3, delivering a modern take on a classic tragedy. 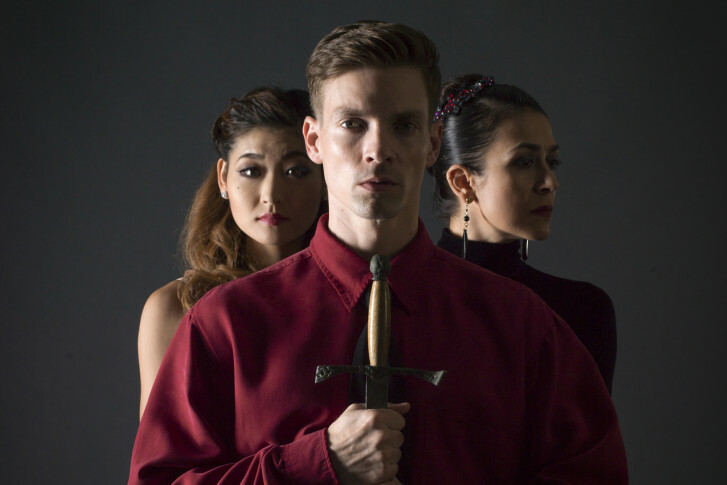 “‘Hamlet’ is a very old story, but we try to tell it in a contemporary way,” says choreographer Stephen Mills, who created this rendition in 2000 when he was Artistic Director of Ballet Austin in Texas. “I knew that I didn’t want to do it in a Danish castle many hundreds of years ago. … If art is relevant in our world, we have to make it so. We have to find a way in which these old stories — which are really beautiful — reflect the society in which we live. So it’s not a king and a queen, but it’s someone of great influence. I hate to say a politician in this city, but it is someone of influence,” Mills tells WTOP. Not only is the setting updated, the ballet also alters several traditional elements. Gone are the skull props, 17-century wardrobe and even supporting roles like Horatio, Rosencrantz and Guildenstern. Most importantly, the poetic soliloquies have been replaced entirely by dance movements. “How do you turn that into a ballet when Shakespeare is so much about the words? The genius of Shakespeare is in the words, but also the genius of Shakespeare is in his understanding of human nature and human foibles. Dance is particularly adept at telling these human stories metaphorically. If the ballet is successful, it is in that metaphoric telling of the story,” Mills tells WTOP. So how did Mills go about stripping down the verbiage and sculpting it into dance? “You take this basically five-act play and you have to edit it because you can’t do a five-act ballet. No one wants to sit for three hours watching, so distilling it down to the essential story, which is the idea of a son revenging his father’s death, his murder. So once you cut all that other stuff away, it makes a very clear, linear story. … Mercifully, it all fit together like a puzzle,” Mills says. The first step was finding the proper music. To do this, Mills listened to a collection of pieces by composer Philip Glass, who won a Golden Globe for “The Truman Show” (1998) and earned three Oscar nominations for “Kundun” (1997), “The Hours” (2002) and “Notes on a Scandal” (2006). “I had always wanted to use Philip’s music, but it had been financially out of my reach. … Philip didn’t write this score specifically for this ballet. It’s a collection of pieces from his film ‘Anima Mundi’ as well as his first violin concerto. It’s an awesome score. … His music is so filmic in nature,” Mills says. With the music picked out, it was time for Mills to match it with movements. “We see Ophelia, this major, beautiful ballerina, fluid, passionately showing the love, and then there’s another scene where she comes out, and she’s flat-footed, no point shoes, hair down, just emotions. It’s just so human and real, and it’s a really great way to see the juxtaposition of a human being, from being so held and poised, to losing it all at once. It’s so moving,” says dancer Luis Torres, who plays King Hamlet, the ghost father of the title character Hamlet (Jonathan Jordan and Brooklyn Mack). “He’s killed before we even arrive at the theater,” Mills jokes. Yes, just like the murdered Mufassa appearing to Adult Simba in Disney’s own “Lion King” version of “Hamlet,” Torres appears as the legendary apparition in an important moment of soul searching. This so-called introspection scene is arguably Mills’ favorite moment in the entire show. “It’s the Philip Glass violin concerto, and the middle section of that is this beautiful adagio, which is just heart wrenching. In the scene, Hamlet is by himself and he is reliving all of his relationships to the people he has wronged, starting with his mother all the way through the list of characters, and really it’s about guilt. The way these dancers portray this particular scene is very moving,” Mills says. After this moment of introspection, the ballet closes with a rousing, action-packed sword fight. “Even though the piece is contemporary and they’re wearing suits and tights, what I love about it is that the last scene of the ballet, it’s a duel. The swords of Shakespearean times come back! They actually have a sword fight, which is very exciting,” Torres says. Mills says it was thrilling staging the sword fight, which remains intense each time he watches it. “There’s nothing more fun than a sword fight. Classical fencing is so much fun. It comes out of the French court, just like ballet does … To be able to take all of that and turn it on its head, it’s really a vicious fight. … Even though I’ve seen this duel a hundred times in rehearsals and performances, I still kind of push myself against the wall once it starts because it makes me so nervous,” Mills admits. Whether it’s a gripping sword fight or a water-dance sequence (which they won’t spoil here), the ballet is unlike any “Hamlet” you’ve seen. And yet, the universal themes remains just as timeless. Which brings us back to our opening paraphrased proposition. To see or not to see? This time, there is no question.